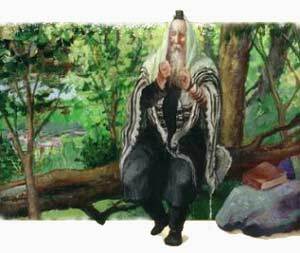 Note: The following is a freely translated excerpt of Chassidism's founder Rabbi Israel Baal Shem Tov's account of his childhood and formative years, as related by the previous Lubavitcher Rebbe, Rabbi Yosef Yitzchak Schneerson. When I was five years old I was orphaned from both my father and mother. The last words spoken to me by my holy father before his passing were: "Yisrolik, fear nothing but G‑d alone." Consonant with my father's words I was drawn to walk the fields and the great, deep forest near our village. From cheder I would make my way to the fields, where I would review by heart what I had learned in cheder. Often I would sleep over the night in the field or the forest. My guardians, who looked after me and several other orphan boys and girls, did not tolerate this behavior of mine to wander in the fields and the forest, and dealt severely with me. So passed two years. One morning, I heard in the forest the sound of a human voice. I followed the direction of the voice and came upon the figure of a Jew enveloped in tallit and tefillin, praying with a fervor such as I had never before witnessed. I hid myself behind the trees and derived great pleasure listening to the man's praying. I was enthralled by the extraordinary sight, and thought to myself that this holy man must be one of the thirty-six hidden tzaddikim (righteous and saintly people) that are in the world. The tzaddik concluded his prayers, removed his tallit and tefillin, and began to read from the Book of Psalms in a melodious voice. Following his recital of Psalms, the man spent some time in ecstatic Torah study. He then gathered his books and his tallit and tefillin and placed them in a sack, lifted the sack unto his shoulders, and set off on his way. At this point I stepped out from my hiding place and walked towards him. When the man saw me he asked: "What is a small child doing all alone in the forest? Are you not afraid to be in the forest all by yourself?" I answered him: "I like the field and the forest, because there are no people—the great majority of whom are arrogant and dishonest. I am not afraid of anything. I am an orphan without father or mother. My father, peace be to him, said to me before his passing: 'Yisrolik, fear nothing but G‑d alone.' So I'm not afraid of anything." The man asked me if I was Reb Eliezer's son. When I replied that my father was indeed called by that name, the man took a volume of Talmud—the tractate Pesachim--from his sack, and sat and studied with me for a while. I then joined him on his way, without knowing where we were going and what was the purpose of our journey. In our wanderings, we would stop for different periods of time in various cities, towns, villages and hamlets—sometimes for a few days, sometimes for a week or longer. I never learned the man's name. I would study with him each day. He never accepted alms from anyone, yet he fed and clothed me and looked after my needs all the time. Thus passed three years. One day we stopped in a small settlement and the man said to me: "Not far from here, in the forest, there lives a learned and G‑d-fearing Jew. I will leave you with him for a while." He then took me to a small hut in the woods, handed me over to its resident, and was off. I lived in Reb Meir's hut for four years, during which time he learned with me with great diligence all the time. Each day, we would go to the village for the daily prayers. None of the villagers were aware that Reb Meir was a sage and hidden tzaddik--they knew him as a simple workman, a charcoal smelter. In Reb Meir's home I became familiar with the ways of the hidden tzaddikim and their leader, the great sage and tzaddik Rabbi Adam Baal Shem. At the conclusion of my years with Reb Meir I was accepted into the society of the hidden tzaddikim and again began journeying from town to town and from settlement to settlement on various missions which the society's leadership placed upon me. Before having attained sixteen full years, I had gained a significant knowledge of the teaching of Kabbalah and would occasionally pray with the mystical meditations of the Lurianic Kabbalistic tradition, taught to me by the holy and awesome hidden tzaddik, Reb Chaim. On my sixteenth birthday, Elul 18, 5474 (1714), I was in a small village. The local innkeeper was a simple Jew who could barely read the prayers and was completely ignorant of the meaning of their words; yet he was an extremely devout Jew, whose custom was to say regarding everything and on every occasion, "Blessed be He for ever and ever." His wife, the innkeeperess, would constantly avow: "Praised be His holy name." That day, I went to meditate alone in the field in accordance with the practice, instituted by the early sages, to set aside time on one's birthday for private contemplation. I secluded myself, recited chapters of Psalms, and meditated upon the unifications of the divine names as prescribed in the teachings of Kabbalah. Thus engrossed, I was completely unaware of my surroundings. Suddenly, I beheld Elijah the Prophet standing before me, a smile on his lips. In Reb Meir's home, and in the company of other hidden tzaddikim, I had, on occasion, merited a revelation of Elijah the Prophet, but never before on my own, so I wondered at the reason for this unexpected vision. I also could not understand the significance of the Prophet's smile. Elijah said to me: "You are toiling mightily, investing great effort and concentration to meditate upon the unifications of the Holy Names implicit in the verses of the Psalms compiled by David the King of Israel. On the other hand, Aaron Shlomo the innkeeper and Zlateh Rivkah the innkeeperess are completely unaware of the unifications that emerge from the utterances, 'Blessed be He for ever and ever,' expressed by the innkeeper, and 'Praised be His holy name' uttered by the innkeeperess. Yet these words resonate through all the worlds, causing a greater stir than the unifications configured by the greatest tzaddikim." Elijah the Prophet went on to explain to me the great pleasure that G‑d derives from words of gratitude and praise uttered by men, women and children, especially by simple folk, and especially when this is done on a consistent basis, reflecting a pure faith, wholesome heart, and a state of perpetual attachment to G‑d. From that point on I embarked upon a new method of serving G‑d: to bring about the speaking of words of praise to G‑d . Wherever I went, I would talk to people, inquiring after their health, their children, their livelihood, and they would all reply with expressions of praise to the Almighty ("Thanks to G‑d," "Blessed be His Name," and the like), each after his or her manner. For many years I pursued this practice. At a conference of the fellowship of hidden tzaddikim it was resolved to adopt this method of divine service, which in turn became the beginning of an approach which stressed the importance of brotherly love toward every Jew, regardless of his or her degree of Torah knowledge or spiritual attainment. sweet sixteen This is a sweet story that has depth, and, as with all stories, it can be read on many different levels. Perfection Imperfections to us may be perfections to G-d. There is a story of healer, who healed people with her words. One day her son came and told her, her words were pronounced incorrectly, so he "fixed them". She could not heal again until she pronounced the words in her own way. The Baal Shem Tov went to the home of a man who missed a High Holiday Service and had no prayer book at home. The man was depressed over this. Then the Baal Shem Tov arrived at his door and asked him. "What did you do this evening?" The man replied: "It is true, I missed the Service and had no prayer book. So I did the only thing I could, I prayed "Master of the Universe, I have no prayer book and know not the exact prayers so I will recite the Letters of the Hebrew Alphabet and it will be Your job to put them in the right order." "I ask you, Baal Shem Tov was this acceptable?" "Rest assured" said the Baal Shem Tov, "it has been many years since a prayer such as this has risen through the Gates of Heaven!" The Baal Shem Tov's Sixteenth Birthday Although I had previously been aware of the Baal Shem Tov's practice of traveling around and enquiring of simple Jews as to their health, livelihoods, and families, I read this article with great interest. The conclusion moved me to tears, because I, myself, am one of the aforementioned "simple Jews". I am a Ba'alet Teshuvah, and know very little Hebrew, only having learnt to read Hebrew a few years ago, and not being very fluent in the language. Yet, I try hard to internalize the Baal Shem Tov's message of being thankful to the Almighty One for all of the kindnesses and blessings He gives to me, regardless of whether I deserve them or not. And, I try to always be mindful of serving Him with joy, whatever I am doing. Yet, so often it seems to be "not enough". Then, I read an article such as this, and this to myself, "Maybe it is not as inadequate as I think it is, after all". G-d bless Chabad, for giving me hope!